That morning, we all woke up quite early to have morning devotion. My wife then said she was going to visit an uncle at the old Jos Teaching Hospital. At around 8am, I said goodbye to my family and headed for the office. Later that day, at round 5pm, I got a call informing me about the bomb blasts in Jos. The first thought that crossed my mind was ‘my wife is in Jos.’ Immediately, I started dialling her number but it didn’t go through, I also tried that of my sister-in-law, but it didn’t go through too.. He said he began to panic and couldn’t control his emotion. In tears, he said he kept praying that his family would be safe. 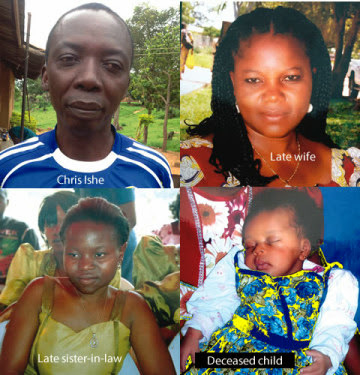 “The corpse of my five-month-old daughter was burnt beyond recognition. I can’t believe my baby is gone. She was my favourite child, whenever I entered the house, she would start screaming. Sometimes, she would not sleep till I got home from work. I still can’t believe she is gone. I don’t know if I can bear her loss, coupled with that of my wife. Sometimes, I think I’m dreaming. My wife was my backbone and best friend. We were married for 16 years. Their deaths have left a void in my life..I cried for hours, I knew I had to go home to take care of my other three children, but I just couldn’t get myself to leave the hospital, I was confused.